God does not ask for ten percent, but for our whole life. We are required to commit ourselves, not just make a financial commitment. “Every man shall give as he is able, according to the blessing of the Lord, your God which He has given you” (Deuteronomy 16:17). New church members complete a commitment form when they join St. George. Payments may be made weekly, monthly, quarterly, semiannually, or annually. You may use a credit card for payment. Stewards in good standing are eligible to participate in the governance of the parish by voting at General Assemblies and serving on the Parish Council. Every Christian has an obligation to support the work of the Body of Christ. 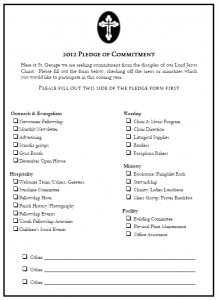 At St. George parish, our expectation is to exceed the Old Testament requirement – that is, to tithe, +1!